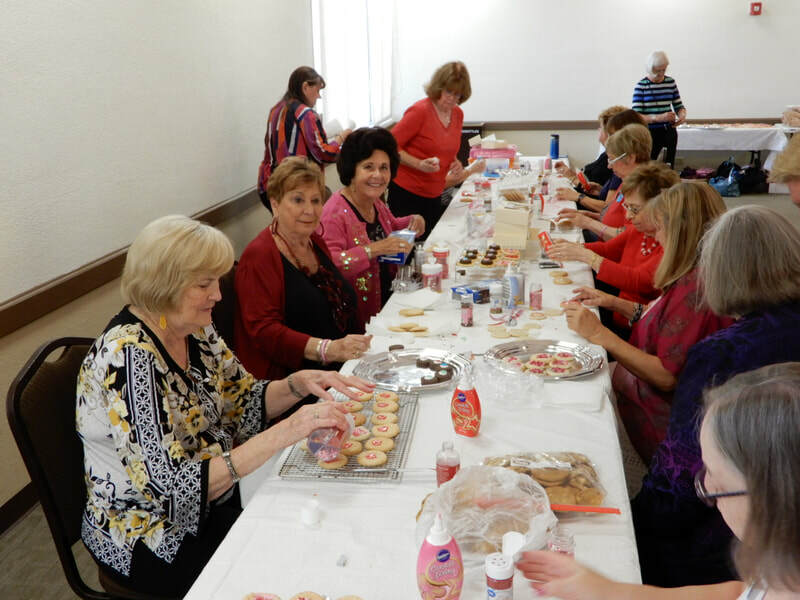 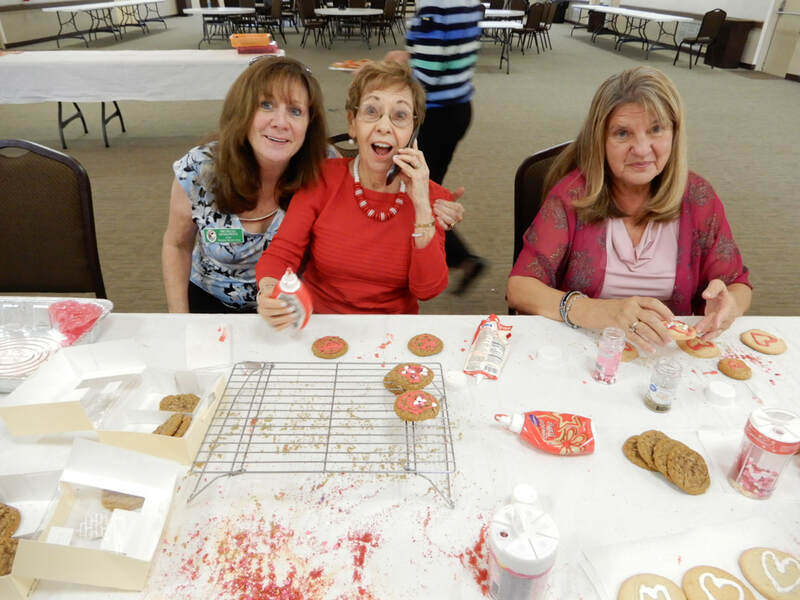 After the February meeting, Diecke Auditorium turned into a cookie factory! 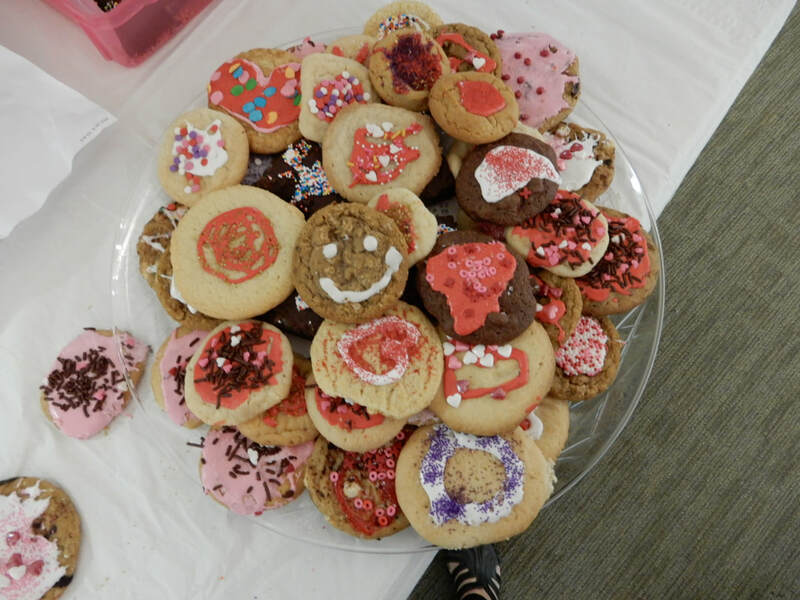 We asked members to bring undecorated cookies to the meeting. 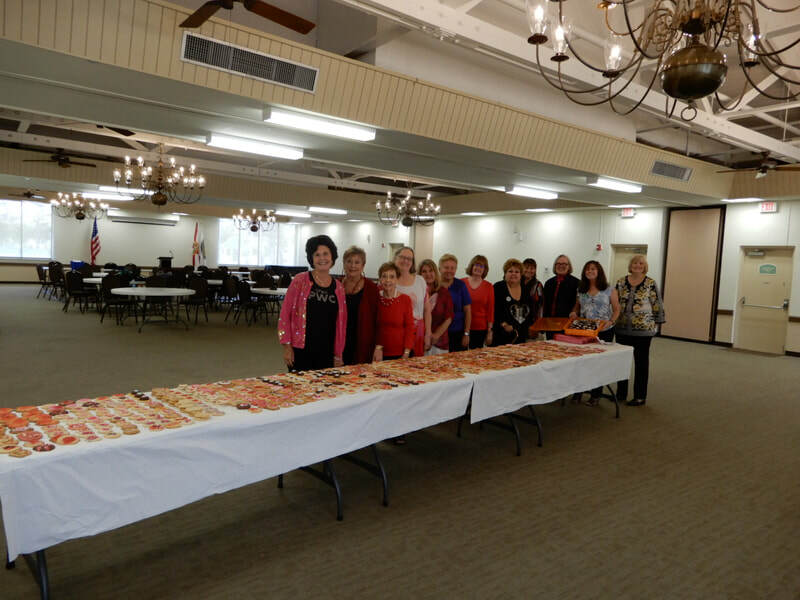 Boy, we PWC ladies came through big time! Decorating tables were set up, but with all of the “decorators” staying to help we had to keep setting up more tables. 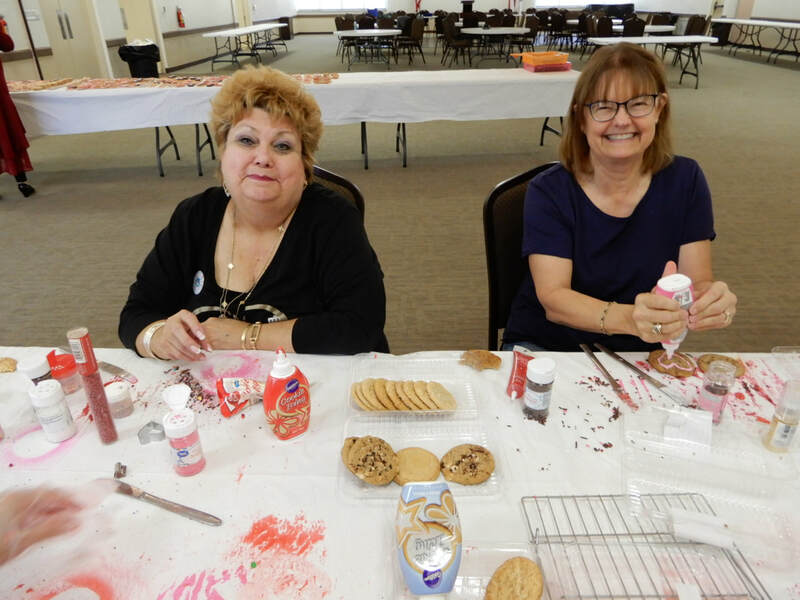 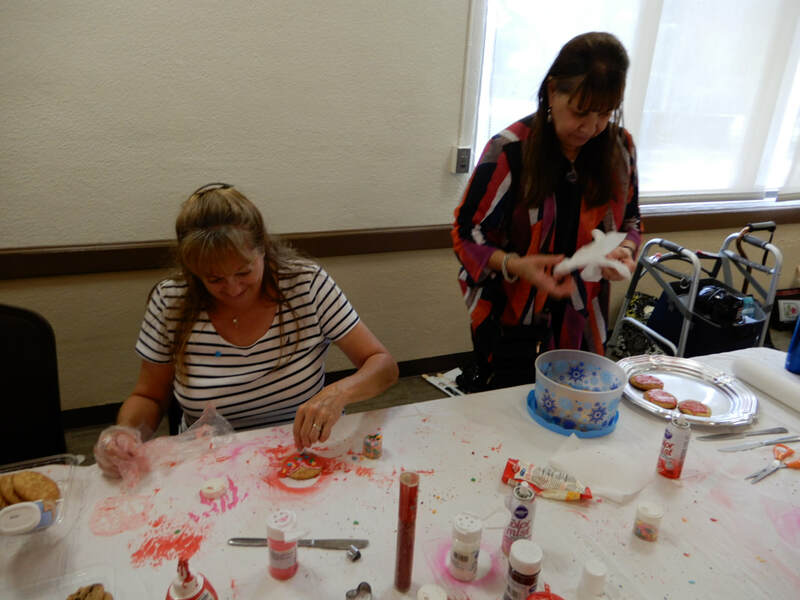 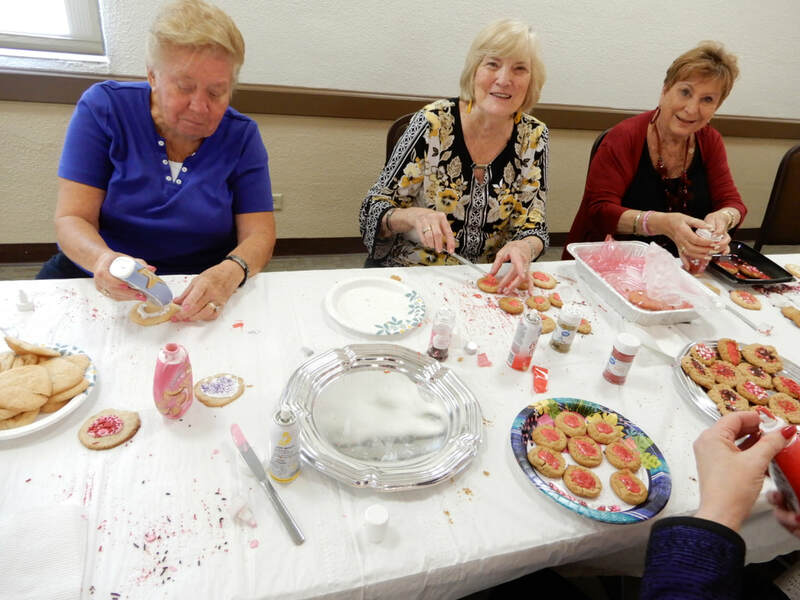 We had red, pink, white cookie icings, edible spray colors in silver, gold and red, gold glitter dust and bottles and bottles and bottles and bottles of sprinkles, decorating sugar and jimmies. 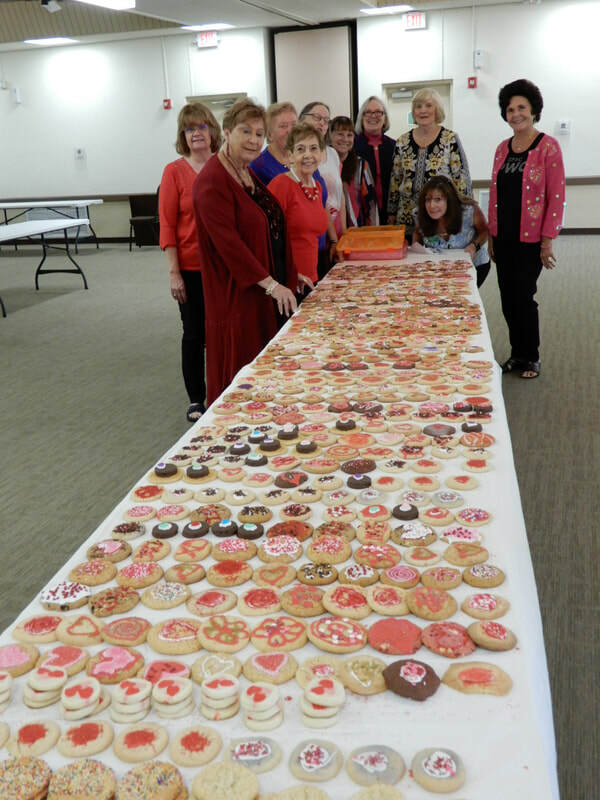 In 2 hours we decorated almost 700 cookies. 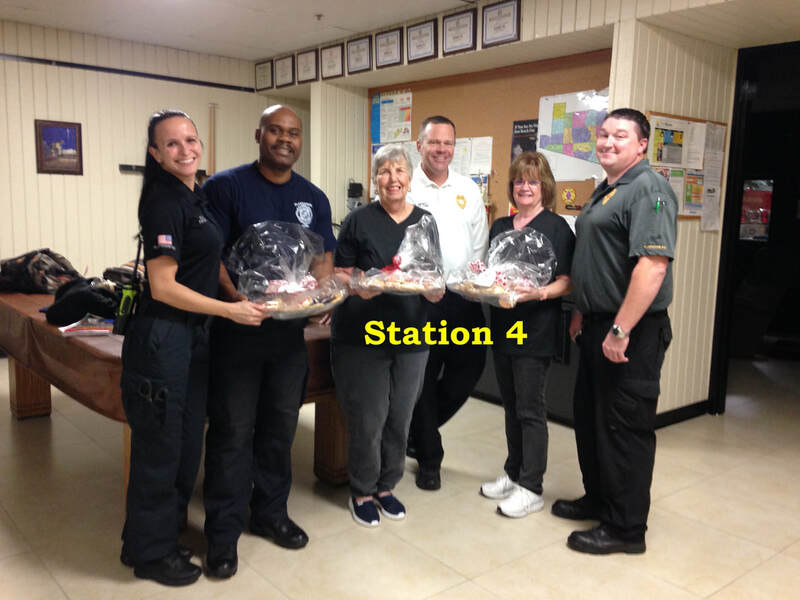 No that is not a typo as you can see from the pictures. 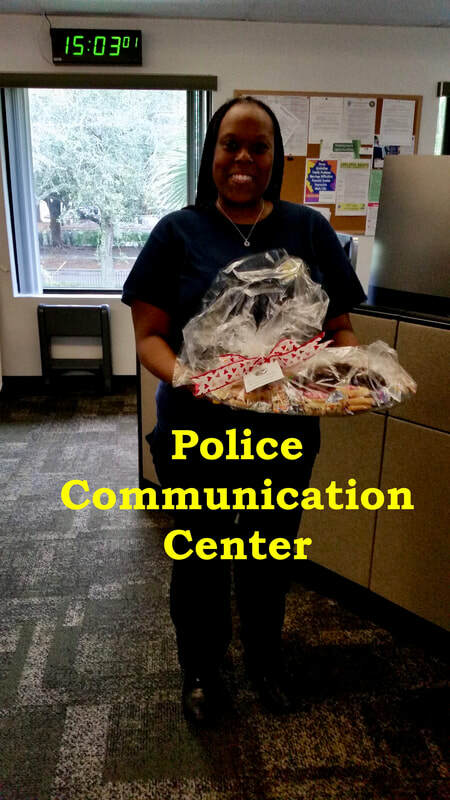 That translated to 24 trays of cookies piled high for our First Responders! 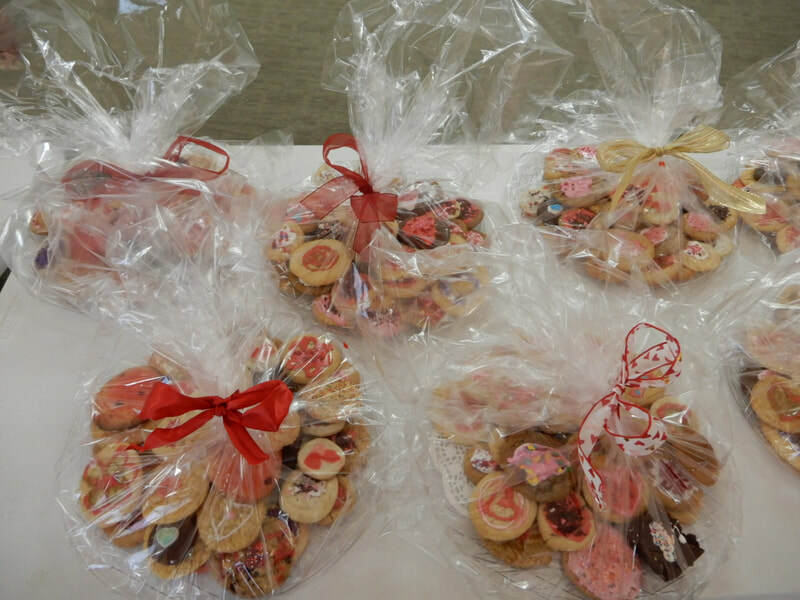 A special thanks goes out to our “adopted PWC member”, Ralph Merritt, for not only taking photos, but also baking and decorating brownies and some cookies, helping wrap the trays and create perfect bows!!! 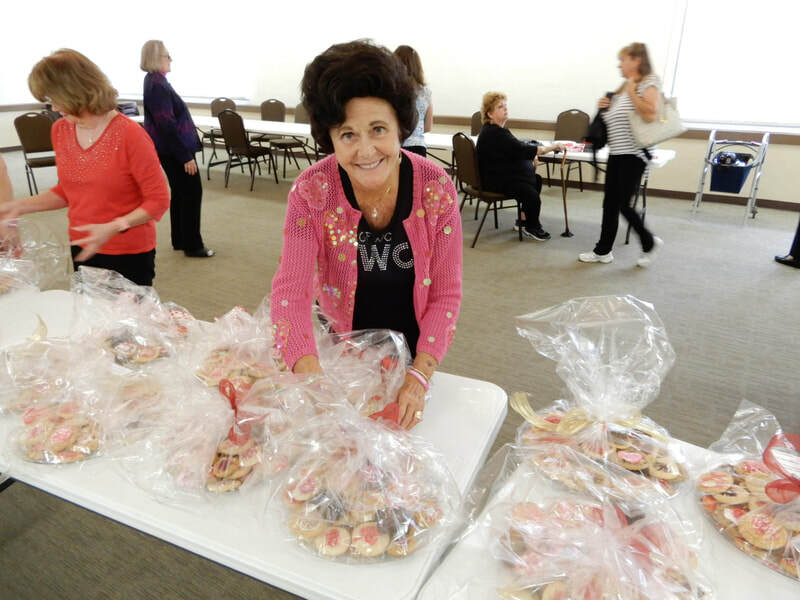 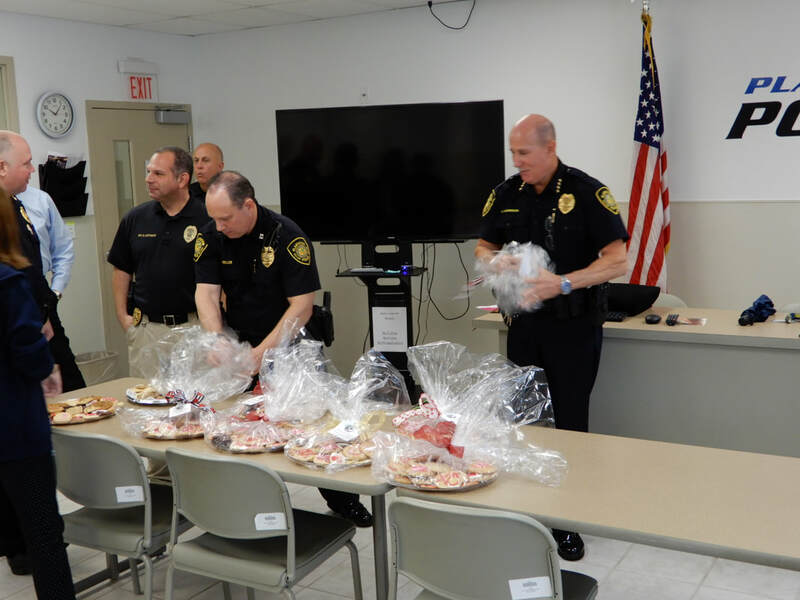 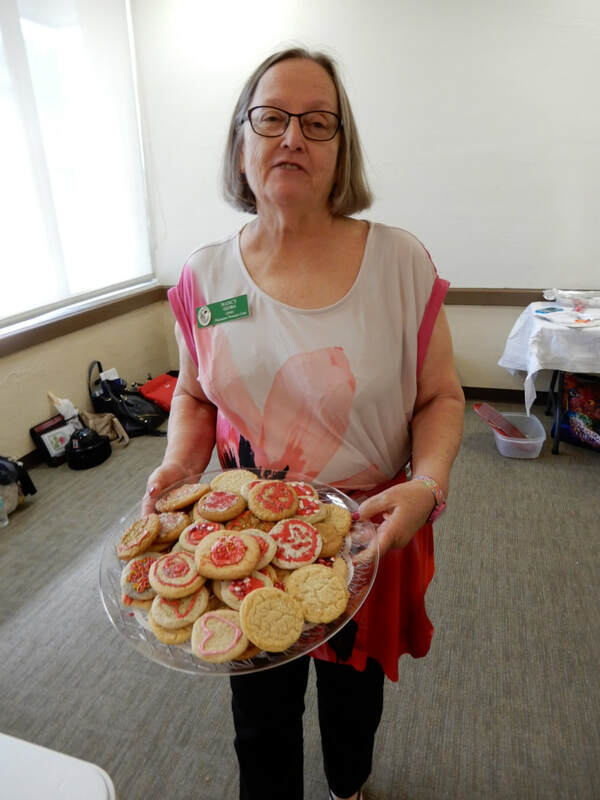 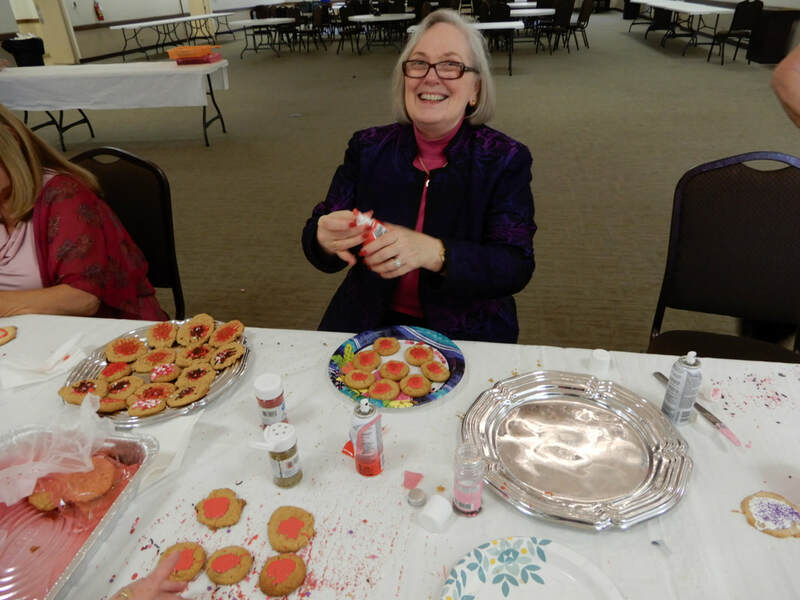 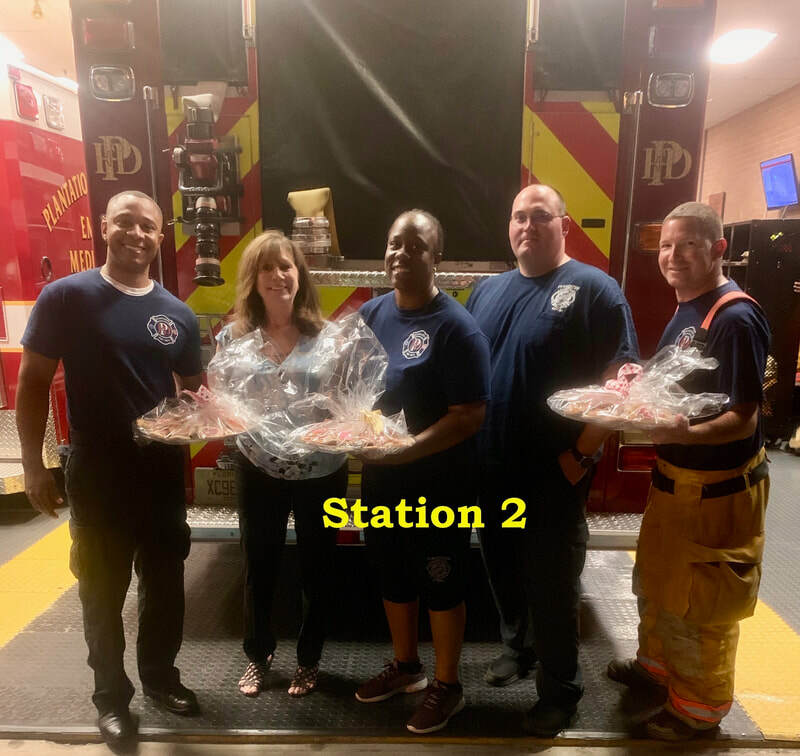 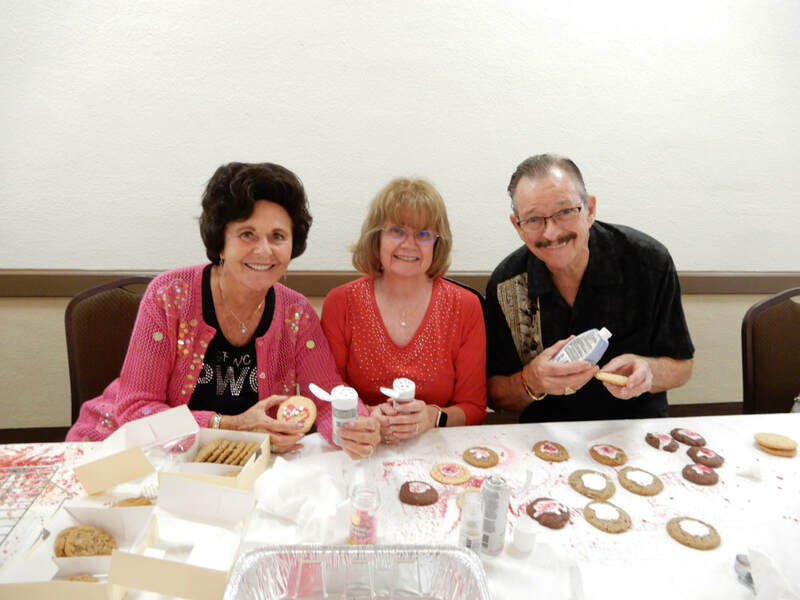 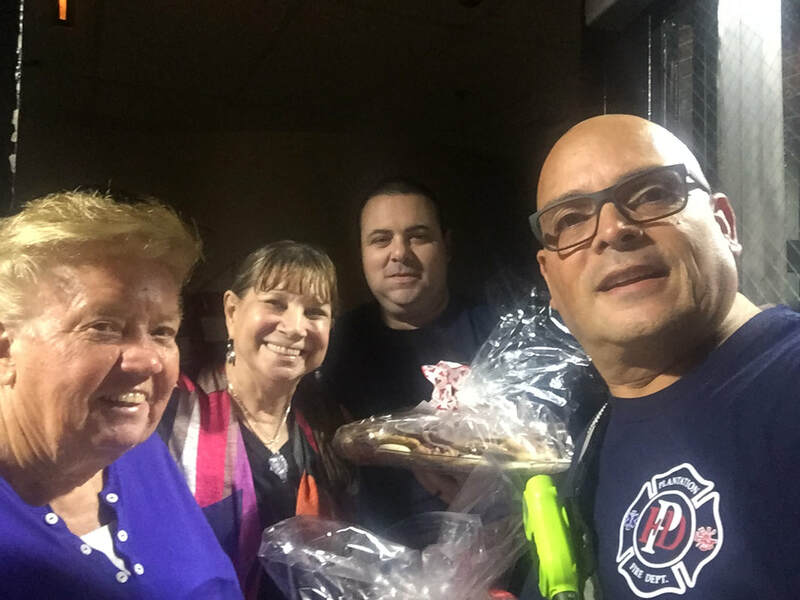 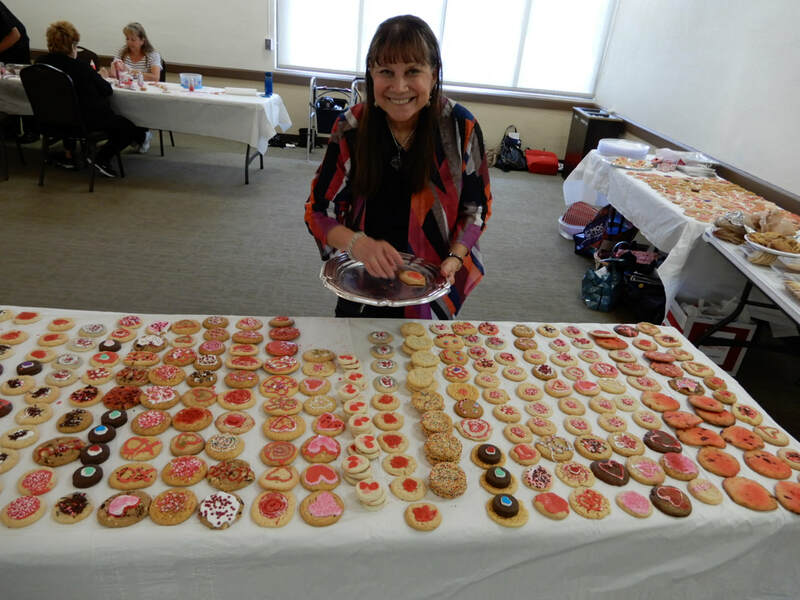 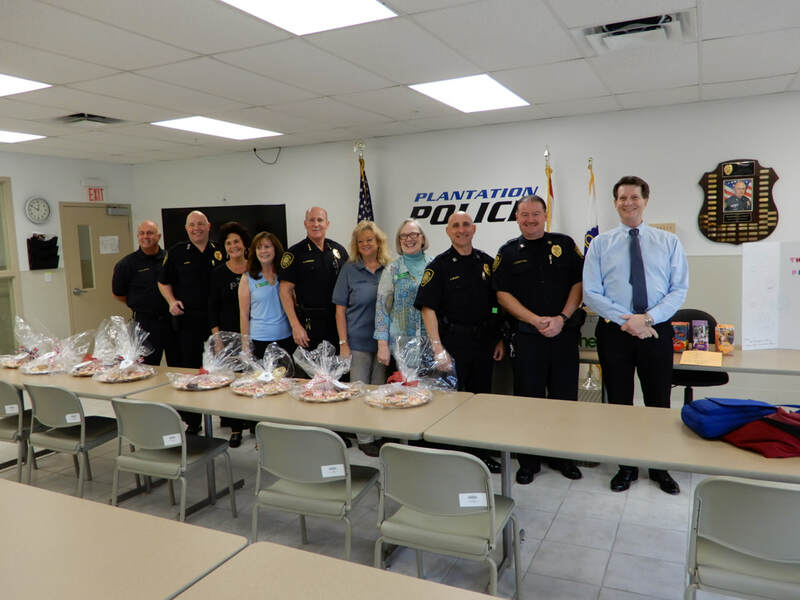 Another thanks goes out to Lynn Braden, who not only baked cookies but also sent out an email blast to the Police and the City spreading the news about the PWC cookie project. 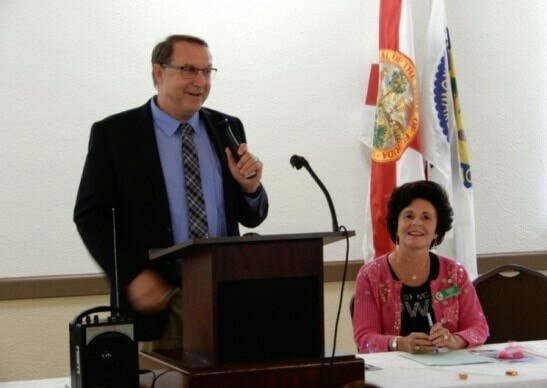 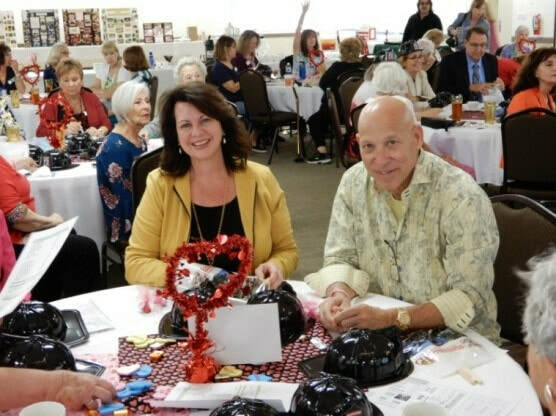 This get together was more of a casual, laid back and fun program where our elected officials shared some personal sides of their lives with us. 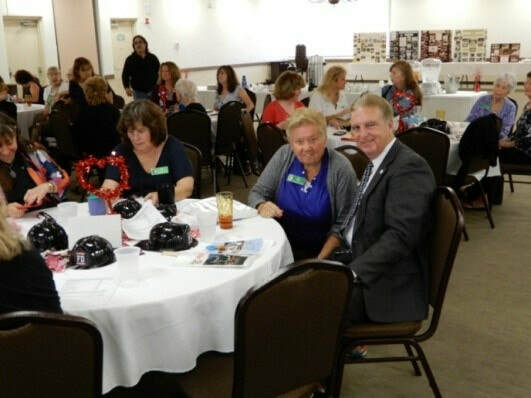 We learned about their families, wives, children, hobbies, grandchildren, sports, work interests and shared an insight of each one beyond politics. 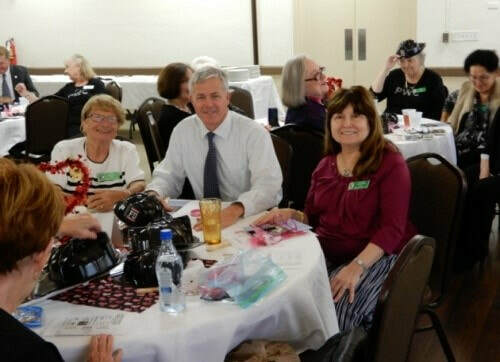 We also enjoyed the time for us all to mingle together and get to know each other. 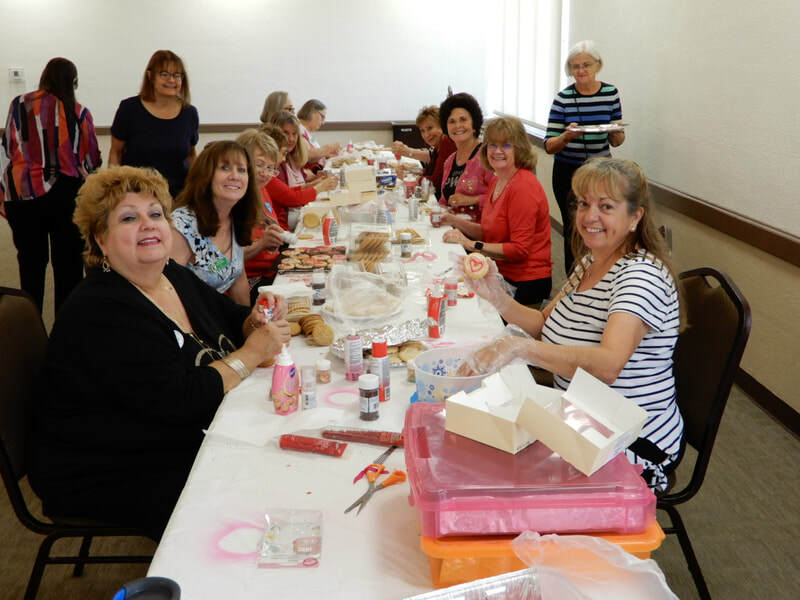 Our catered lunch was wonderful - Chicken Francaise, Baked Ziti, Salad, Garlic and Plain Rolls. 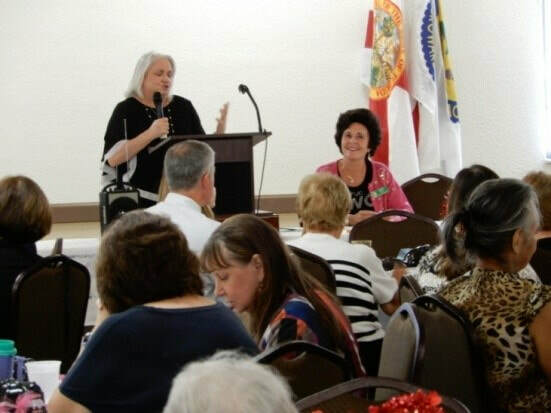 - all catered by Jacaranda Pizza Restaurante. 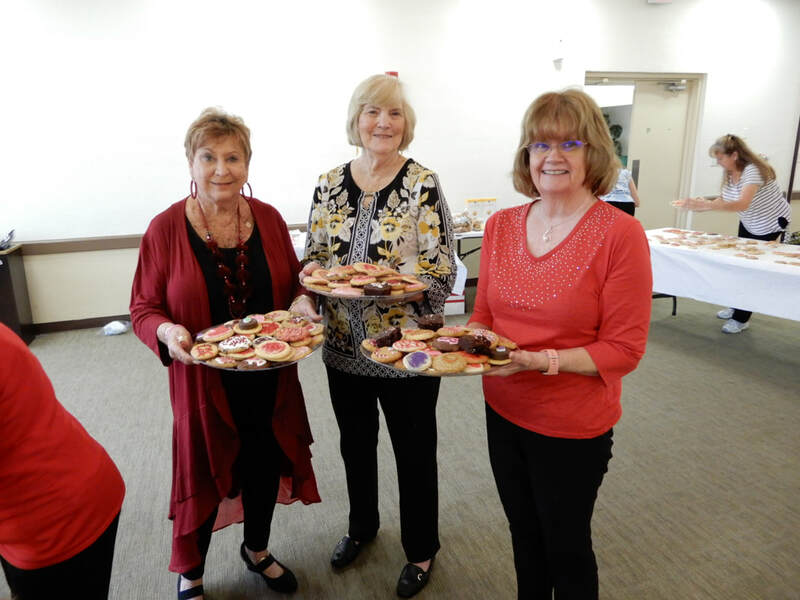 Because February 2019 is the 70th Birthday of PWC, we celebrated with a Vanilla-strawberry-filled Chocolate cake, Key Lime Pie and Lemon Meringue Pie. 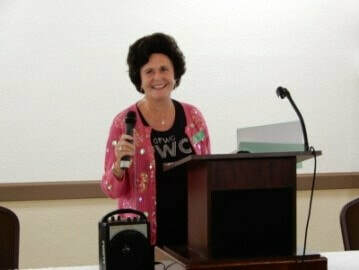 The success of this meeting was due to many members, Jennifer Nieset and our wonderful telephone callers; Michelle Moskowitz and crew for the delightful Valentine decorations, cute hearts and chocolates; Karinne Bernstein for more yummy chocolates; Pat Hinde and her committee for the food presentation, our set up and clean up Ladies. 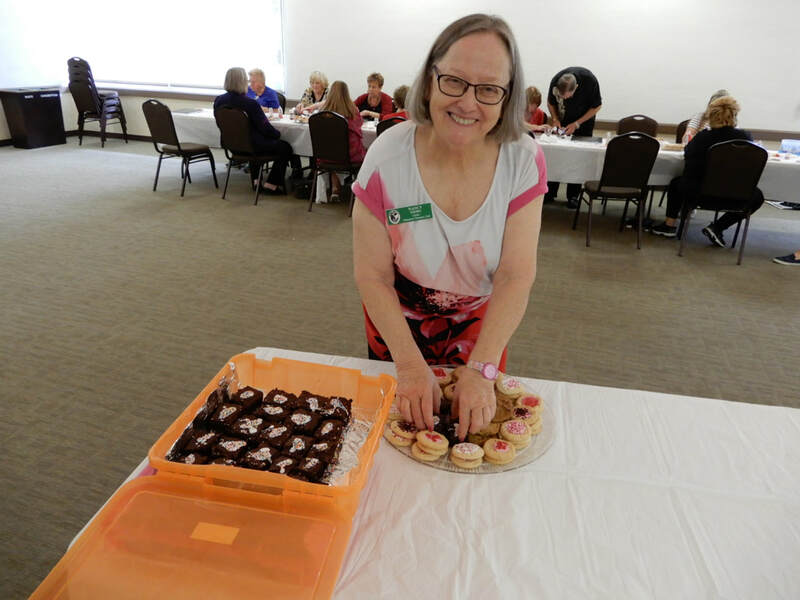 Ann Ebbert, our fun ‘timer’…A million thanks you all! 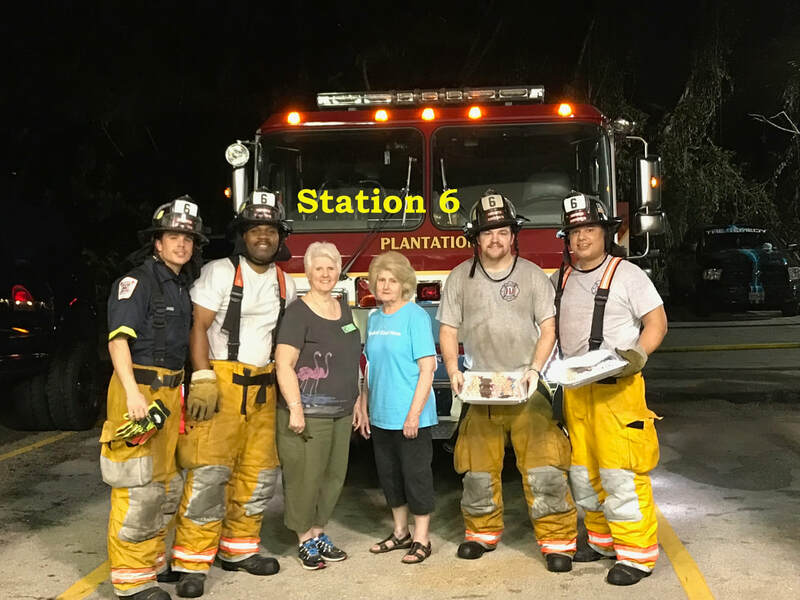 Public Issues - We appreciate the City for supplying their Economic Development Guide on Plantation, the Police Department for their information on Broward 2-1-1 (a buddy program to check on Broward Seniors each day) and the Fire Department for their cute black helmets, a wooden ruler that doubles as a hot oven push/pull stick, a bottle top opener, a bracelet and key chain.